This weekend we celebrated with my sister-in-law at her baby shower. We will be welcoming sweet baby Avery into the family sometime in October! 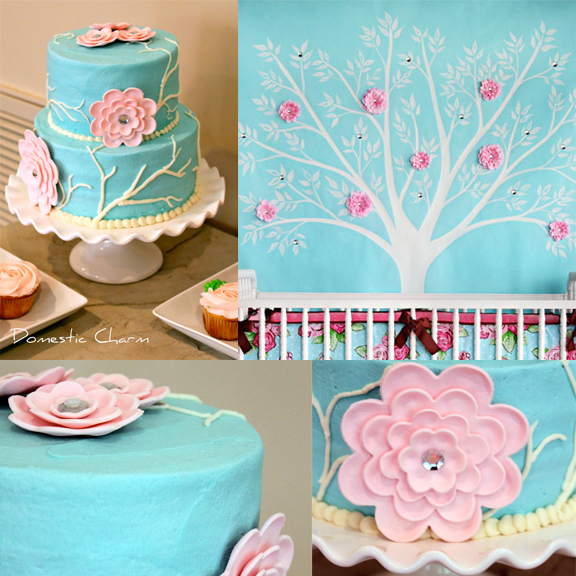 I made this cake for the shower to coordinate with her beautiful nursery decor by Caden Lane. 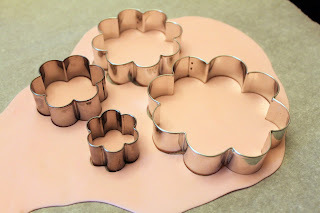 I made the flowers from gumpaste and some rhinestones (that were not edible) for the centers. I frosted the cake with butter cream frosting using a sky blue food coloring and piped on the branches using frosting tips #3 and #5. 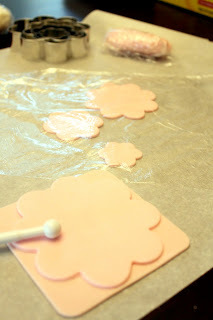 I also used tip #5 to pipe the beading around the bottom of each cake. You can follow the steps below to make the gumpaste flowers that I used on this cake. Take a portion of the gumpaste out of the bag and knead it to soften it. You can rub some shortening on your hands to keep the gumpaste from sticking to them. 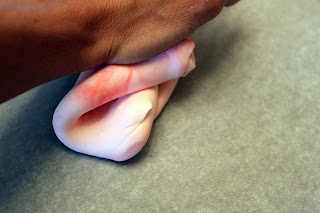 Drop a small amount of food coloring into the center of the gumpaste and knead the ball of gumpaste until the color is even. You can always add more food coloring to make a brighter color, but begin with a small amount. 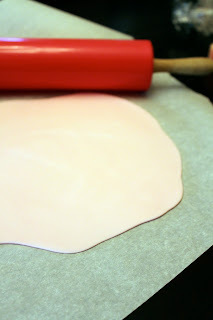 Next roll out the gumpaste onto your work surface until it is very thin. 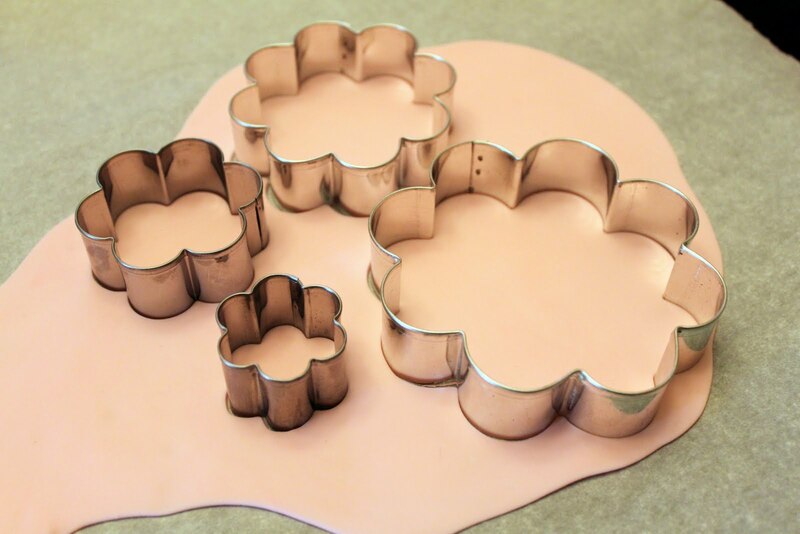 Choose your desired sizes of cookie cutters and begin cutting out the shapes you will need. 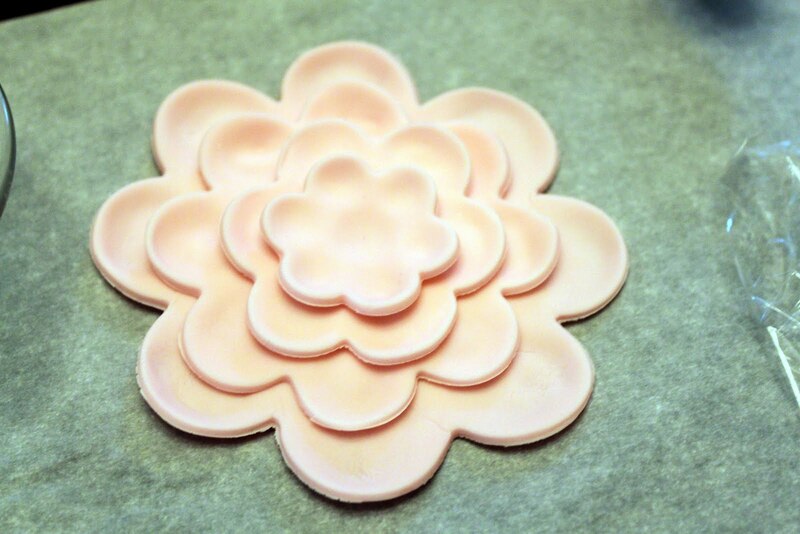 I would recommend only working on one large flower at a time since the gumpaste dries out very quickly. You will need to work quickly and use the plastic wrap to cover the gumpaste that you aren't working with to keep it from drying out. 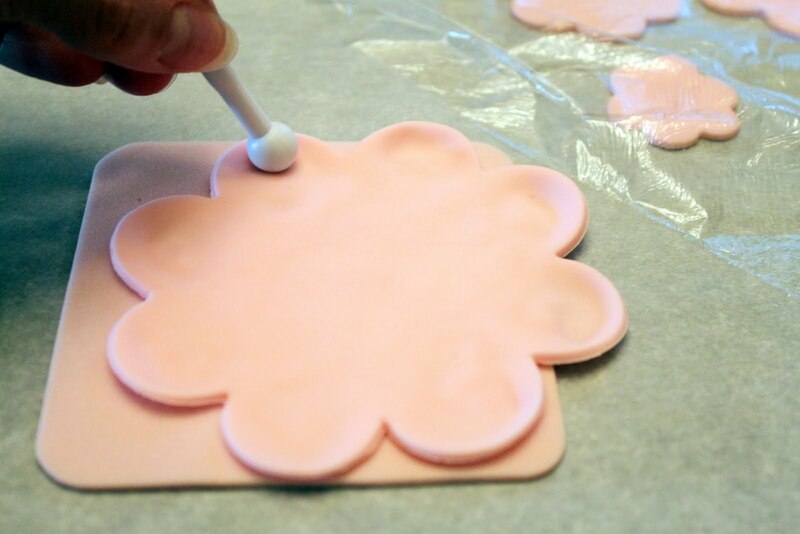 Starting with the largest flower place each piece on the foam mat and using the ball tool gently make a circle motion on each petal. The gumpaste will begin to take shape and thin out. Make sure not to rub it so thin that you make a hole. The edges of the petals should start to curl upward. As you finish each flower you can begin to attach them together. Take the paint brush and dip it into a very small amount of water. 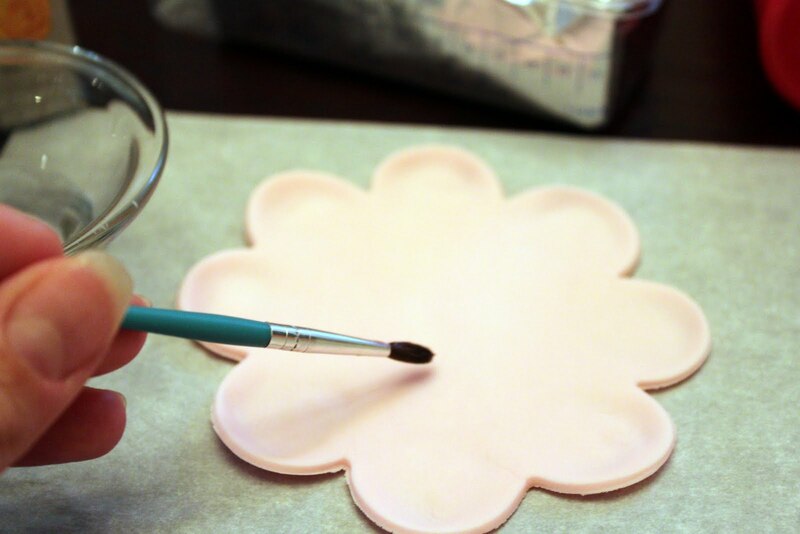 Brush the centers of the flowers with a small amount of water and place the smaller flowers on top, pressing gently. Once you have the smallest flower on top the rhinestone will go into the center. I waited to attach the rhinestones until I was placing the flowers onto the cake. I used a small amount of butter cream frosting to hold the rhinestones into place. 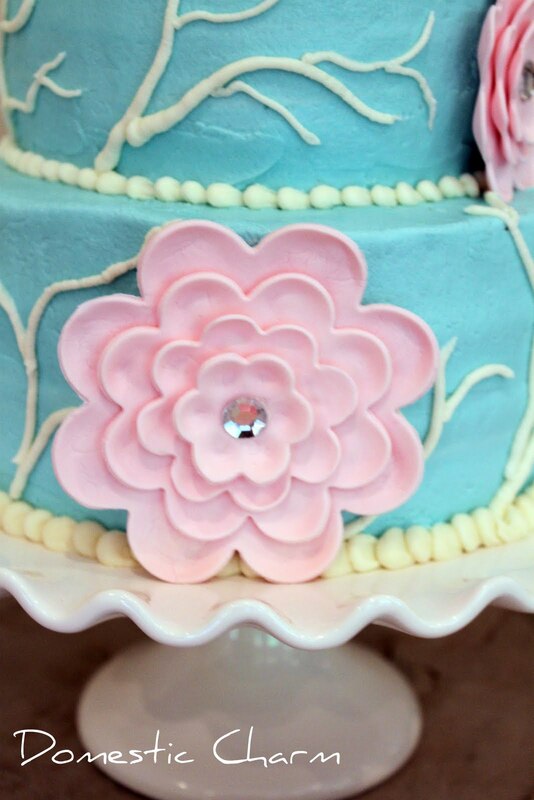 I also used butter cream frosting to hold the flowers in place on the cake. I also made rose cupcakes to match the roses on the Caden Lane bedding . I used the frosting tip 2D to make the rose. You create the rose by starting in the center of the cupcake and circling around to the outside. 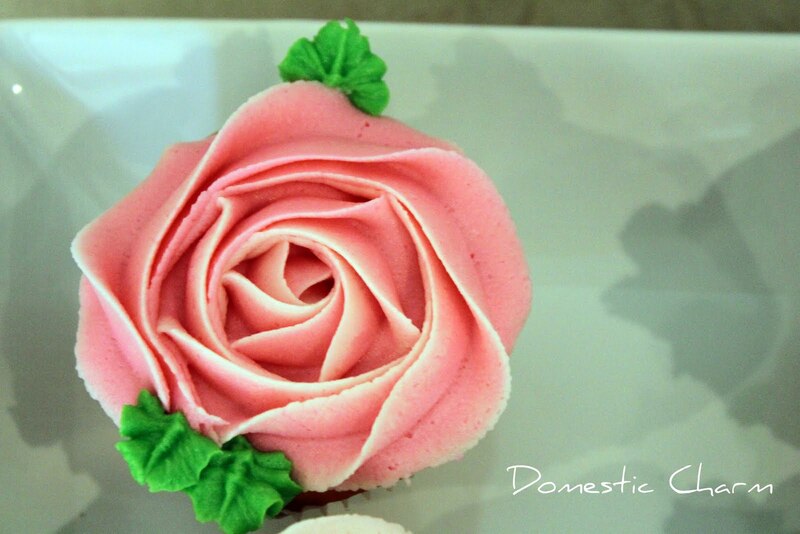 You can make the edges of the rose a lighter pink color by putting a small amount of lighter color pink frosting into the bag first. Then place a darker pink on top. Then you can add leaves to the sides using a leaf tip , I used a #68. 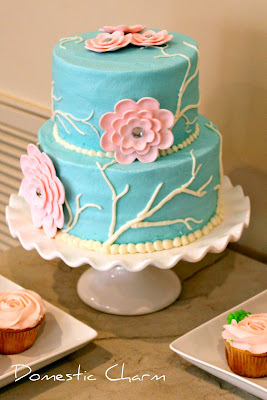 Gorgeous cake and love the color choices, the flowers are beautiful as well. Thanks for the tutorial, loving your blog! How fresh and lovely! Thanks for sharing! beautiful cake. my friend taught me how to do the flowers. i'm not sure i'll ever do it again. i'm not patient. ha.ha. dropped by from life made lovely. This cake looks Ah-Mazing! 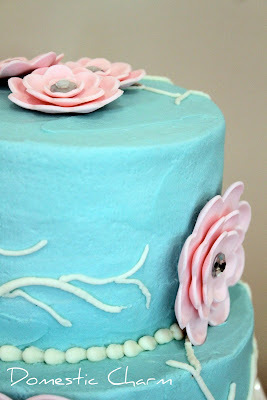 I've never worked with gumpaste before but your cakes looks so stinking awesome I'm feeling inspired to try it. Oh my! That's inspirational right there! Thank you for linking up to the Tuesday Time Out/Tuesday Confessional link party! You have been featured on Confessions of a Stay at Home Mommy, so make sure you grab a button and get your brag on! Pretty! Love the pink and teal! wow, that cake is stunning! great job! Oh my goodness, that cake is absolutely stunning! I love it! I love this cake! I featured it on my blog tonight. LOVE this cake! I clicked on it through TT&J thinking it looked like a great baby shower cake for a shower I'm throwing in a couple weeks and guess what?? The baby's name is going to be Avery too! Your buttercream and piping is perfection! Fantastic job! This is soooooooo pretty! Amazing! I am visiting from Tatertots and Jello and I am a new follower! 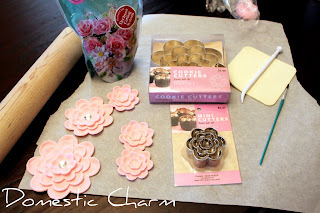 I would love if you would come link this up to my Delicately Constructed linky party!! Hope you have a great weekend and I see you around soon! Wow this is beautiful! I love the colors! Thanks so much for linking up to my party....this weeks party has started!! I have never used gum paste before! I will have to try it! This cake turned out beautiful! Great job!! The cake is very pretty!